Jesus ascended into heaven, there to prepare a place for us, for us. Ascension is but a type of our own. Also He will come again to take un to Himself (Gospel) and introduce us into His Father’s kingdom. He went up to heaven to proclaim the dogma we sing every day in this octave in the Credo; “I believe in the Holy Ghost, who proceedeth from the Father and the Son.” And it is from heaven above that He, with the Father, is about to send us the Holy Ghost. He went up to heaven because glorified human nature requires such a place of glory as heaven. 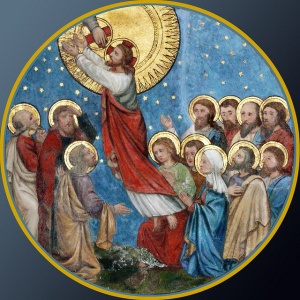 Finally, He went up to heaven because, after having been brought to a belief in His Divinity, the apostles and the disciples of our Lord must also be led to believe in His humanity, henceforth invisible here below.